Can I do it? Can I actually start a blog this easily?Lets find out. Here's my MuMu Bijoux quilt. My favourite! I made it after learning free-form paper doll piecing at a workshop. There are hidden sea creatures in the actual quilting...I put them there as a fun eye-spy game for my kids. The sea waves are quilted with a 9wt pearl cotton hand-dyed by Ellen Noble (purchased at APNQ several years ago). I wound the skein onto a bobbin, then used it through a size 90 topstitching needle. The girls and their dresses were inspired by my late mother-in-law and her love of the muumuu. She would purchase fabric in Maui every time she visited, then return home and make herself a comfy muumuu to wear around the house. I like to think of it as a real-life reflection of what women look like on the beach - all colours, all sizes, all fabulous! Hi Krista. So glad to see you in blogland. Welcome! I'm looking forward to follow your blog. Krista you did it! Hooray for you - such a lovely blog. I haven't really been a blog person to this point - it seems that one can get lost in blog land and forget to come up for food or other important events - but I think I am hooked!!! Hi Krista, Thanks for pointing me to your blog. I definitely will be checking in to see what you are up to. I thought I would post a comment to let you know that I am reading the blog. 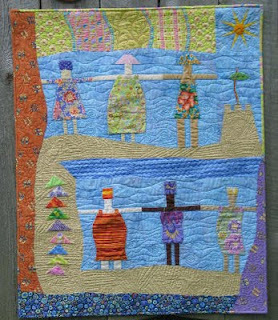 It is fun to see into your quilting life and hear about the quilting friends. I love the pictures. I am looking forward to the insert on your Sister in law and how she inspires your work. Love Corrie.